For nearly two decades now, Edguy’s Tobias Sammet has been curating the all-star symphonic power metal project Avantasia. Every few years Sammet gathers a crew of voices consisting of previous collaborators and newcomers and creates a new album alongside bandmates Sascha Paeth, Michael Rodenberg and Felix Bohnke. 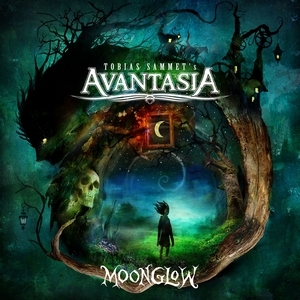 Moonglow is Avantasia’s eighth full-length studio release. Returning to the fold for this album are Michael Kiske (Helloween), Geoff Tate (Queensryche), Jorn Lande (Masterplan), Bob Catley (Masterplan), Ronnie Atkins (Pretty Maids) and Eric Martin (Mr. Big). Those contributing to their first Avantasia album are Hansi Kursch (Blind Guardian), Mille Petrozza (Kreator) and Candice Night (Blackmore’s Night). Sammet takes center stage on the epic opener “Ghost In The Moon,” a soaring track with a backing choir and a catchy chorus. It’s one of two songs in the 10 to 11 minute range, along with the equally ambitious “The Raven Child” featuring Kursch and Lande. “Book Of Shallows” bounces back and forth between Sammet, Kursch, Atkins, Lande and Petrozza. Night is a great addition to the collective, dueting with Sammet on the power ballad title track. The album flows well between long songs and more focused tracks. The MVP of Moonglow may be Geoff Tate. He displays both subtlety and power on the ballad “Invincible” and the more upbeat “Alchemy.” “The Piper At The Gates Of Dawn,” an urgent, electronically-tinged song, has the most guest vocalists, with Atkins, Lande, Martin, Catley and Tate all contributing. The album is as grandiose and bombastic as you’d expect from Avantasia, with ample atmosphere and arrangements with a lot of dynamics. Power metal sometimes goes over the top, but it doesn’t happen a lot on this album. They walk right up to the line and generally stay within it. The only misfire is the closing track. They cover the ’80s song “Maniac,” done originally by Michael Sembello. Sammet and Martin do a version very similar to the original, and though solidly executed, it doesn’t really fit with the vibe of the rest of the album. Overall though, Moonglow is a fun power metal romp with memorable songs and some very talented singers.